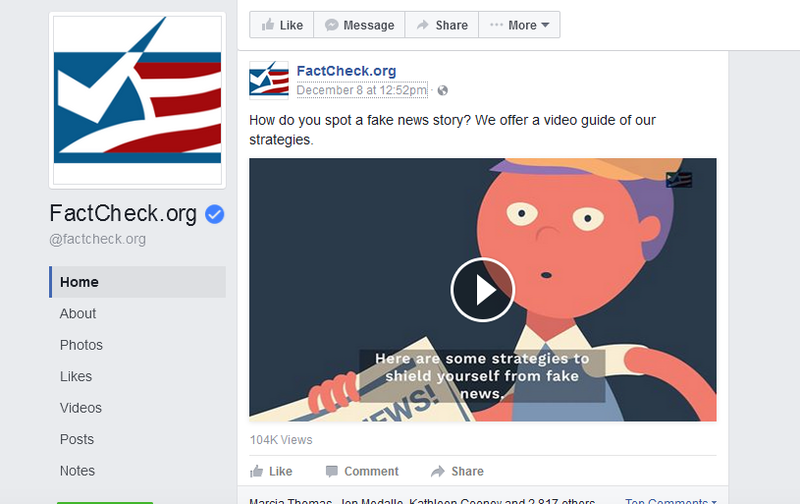 FactCheck.org, the nonpartisan, nonprofit consumer advocate for voters, is among several fact-checking organizations that will work with Facebook in helping to identify and label viral fake news stories flagged by readers on the social media network. Facebook’s initiative responds to a swell of public concern over fake news. It enables Facebook users to report questionable stories in their news feed, alerts outside fact-checking organizations of concerns, and asks whether the fact-checkers have determined the stories to be false. Stories found to be false may be flagged as “disputed” in Facebook’s news feed, appear lower in the news feed, and be accompanied by a link to a fact-checking post about the story, according to Facebook. FactCheck.org’s core mission is to “reduce the level of deception and confusion in U.S. politics.” But it has also been exposing false viral claims since the 2007 launch of its Ask FactCheck feature answering readers’ questions, said FactCheck.org director Eugene Kiely. Image from FactCheck.org’s video “How to Spot Fake News,” posted on its Facebook page. Kiely said FactCheck.org will be notified of stories that have been marked by Facebook users as suspicious and will provide Facebook with links to fact-checking stories if it has debunked those false claims. Other fact-checking organizations that have agreed to work with Facebook are PolitiFact, ABC News, the Associated Press, and Snopes.com. The Webby Award-winning FactCheck.org was founded in 2003 at the Annenberg Public Policy Center (APPC) of the University of Pennsylvania by journalist Brooks Jackson and APPC director Kathleen Hall Jamieson. Although fake viral claims have long been circulated, fake news stories exploded on social media during the 2016 presidential campaign. Under the names of fake news organizations, writers based in Russia and Macedonia as well as the United States have produced scores of bogus stories that proliferated across the Internet and social media, generated thousands in ad revenue and altered the public conversation about what is and is not true. Among the viral fake news stories recently debunked by FactCheck.org were ones claiming that Pope Francis had endorsed Donald Trump and that President Obama had signed an executive order banning the pledge of allegiance. Both are false. FactCheck.org recently posted a story on how to spot fake news and a video on spotting fake news. Kiely answers questions about the initiative here. To read Facebook’s post about this, click here. Eugene Kiely, FactCheck.org: eugene.kiely@factcheck.org, 215-898-2372. Michael Rozansky, Annenberg Public Policy Center: michael.rozansky@appc.upenn.edu, 215-746-0202.